A rocker is a wonderful addition to any child's playroom, and these modern rockers from Little Bird Told Me are sure to excite both parents and their little one. Exquisite attention to both detail and quality in a variety of colours and animals including unicorns, ensure that there is sometime appealing to everyone and for every budget. Baby and toddler rockers of such exceptional manufacturer can be passed down generations and enjoyed for years. Also available are a range of popular sit on toys that kids will love to zoom about on as they improve their motor skills and co-ordination. Baby Brands Direct understands how much parents enjoy the rocking movements’ baby rockers give and how parents would often think of a rocker as a necessity. Our clients can discover Little Bird Told me exclusive designs made of luxurious textured bouclé fabric, super soft scrunch faux suede, and embroidery for 9+ months babies. There are also hidden crinkles, rattles and squeaks for children to discover. The following models feature soft padded seats, small toys as well as sturdy wooden frames with detachable footplates. Find the perfect playmates for your clients’ little ones. 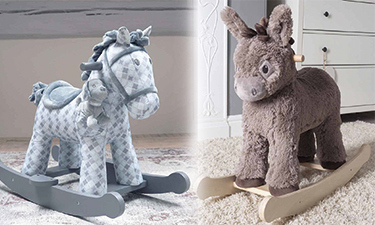 With our horses, snails and caterpillars soft and huggable bodies, our rocking animals will delight young riders and your customers.